When each of us chose to become a member of a fraternal organization, we found lifelong friends, support to excel in studies and opportunities for leadership development and community service. What many of us probably did not expect was the bond rooted in Greek traditions that we not only share with members of our specific fraternity or sorority, but also with members of other fraternal organizations. There are more than 4 million sorority women and more than 4.5 million fraternity men – that’s a lot of people who share a common bond of sisterhood and brotherhood. Think about those numbers and the networking opportunities! If you are a college student embarking in a summer job or internship, or even beginning your first full-time job after graduation, you are joining a work environment where you no doubt will have the opportunity to network with fellow fraternity and sorority alumni. By talking about your fraternal experiences, you most likely will be opening doors to endless possibilities in career and volunteer opportunities. I speak from experience. When I interviewed for my first job, the person interviewing me asked about my sorority experience listed on my resume. She shared she was a member of Kappa Delta, and we “clicked” immediately. She hired me on the spot. I’m convinced it’s because we bonded over sorority life. Whether you joined a fraternal organization two months ago, five years ago or 50 years ago, hopefully, your experience, like mine, was amazing. So, don’t be afraid to tell your story even when it is sometimes hard to be a fraternity or sorority member. Our organizations have become tarnished by heavy alcohol consumption and binge drinking, hazing and lack of responsibilities. The activities of fraternity and sorority members that have led to deaths, mental and physical injury, poor academic achievement and health problems are a contradiction to our rituals and founding principles. Therefore, we have to have conviction to fight the negative and promote the positive. We are the best public relations we have. 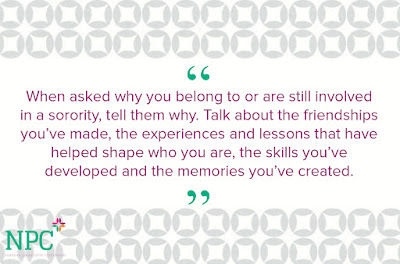 When asked why you belong to or are still involved in a sorority, tell them why. Talk about the friendships you’ve made, the experiences and lessons that have helped shape who you are, the skills you’ve developed and the memories you’ve created. 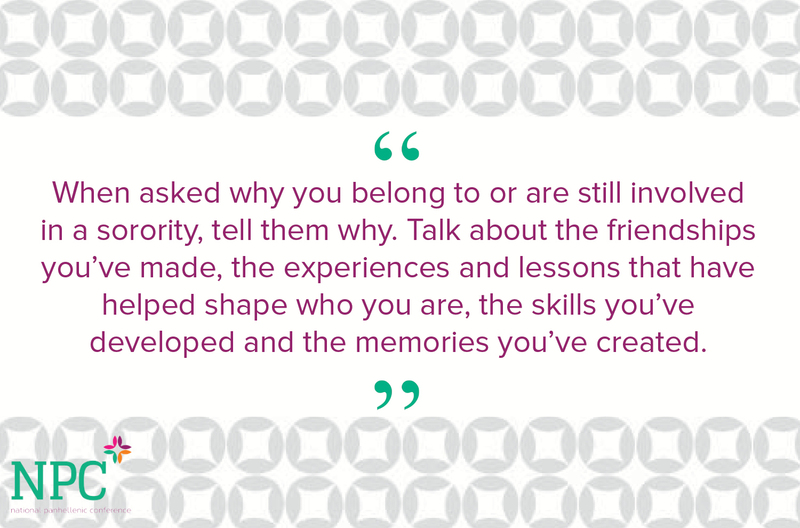 For sorority alumnae, it’s our responsibility and privilege to give collegiate members and young alumnae the assistance they need in building relationships as they seek job opportunities. We should also be telling our sorority stories and sharing our experiences so young women participating in recruitment today will have heard the good news about our organizations or know someone who is a member long before they enter college. The bond of fraternity and sorority membership is strong. We know it inside our hearts and inside our communities. To ensure others can continue to share in this bond, we must also be strong in telling others about our positive experiences and the benefits of membership we all enjoy.